The changes made to the 4th edition, are the removal of the section on skylights completely. And the addition of two other sections. The information covered in this title, refers to only the drawing of and patterns for the typical sheet metal, duct work, gutter and cornice along with other building details that are coming back in favor. Whether through restoration or new old style design. That is the shop problems carried along in the title. Since it is a drafting book for use in Voc Ed classes. All though it was written in the 1920's, the only thing that has changed is the method of drawing and laying out the patterns. Today it is done by computer and the print button on a large format printer/cutter. The book has been revised a number of times to this addition and probably has gone through a number more since this edition. 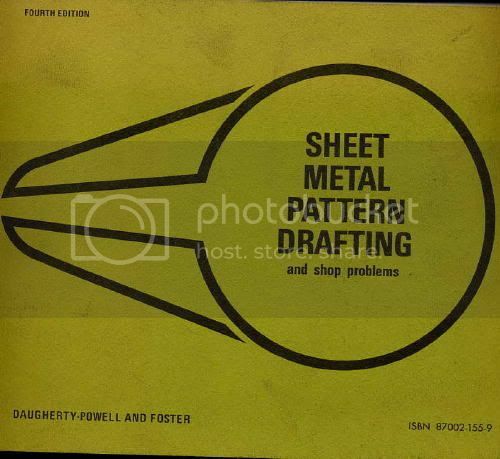 The math,geometry and operations done to get the patterns haven't changed and for somebody that may only do an occasional job an old sheet metal book may save the day. It has B&W photos, drawings through out for each problem.